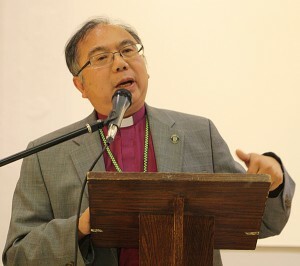 Patrick Yu is an Anglican bishop in the Diocese of Toronto; one of the largest Anglican dioceses in North America. For the past two years he has led a course in evangelism for men and women preparing for ordination in that diocese. good idea! interviewed Bishop Yu to explore what this new endeavor was all about. gi: What sparked your interest in training soon-to-be pastors in evangelism, and what is it about the context of the church today that makes such training important? PY: We have this relatively new situation in Canada. We are no longer in Christendom. People no longer come to church out of habit or cultural obligation. On the other hand, Canada is ripe for harvest. The new reality is not so much opposition to the Gospel, but indifference and ignorance toward it. I firmly believe that God will always find people to bear witness to Him in word and deed. So God’s Church will continue. But those congregations which have not learned how to share the faith will not be part of it. More basically, evangelism is a vital part of the Christian life. Sharing faith brings joy and lets us see how God works. Conversely, when we forget how to share, each of us is diminished as a Christian, and the Church is also diminished. At our 2013 Synod (Diocese-wide gathering) our Archbishop, Colin Johnson, charged the whole Diocese to own and tell the story of Jesus. That was also the theme of the keynote speaker, Bishop Jane of the Diocese of Edmonton, although they hadn’t known what each other was going to say! So there was a God moment; a waypoint in the Diocese of Toronto turning towards mission. Shortly after, the Archbishop decided that every person offering themselves for ordination would take a course in evangelism before he would ordain them. He asked me to lead the course. gi: What are the top five things about evangelism you hope your students will learn? I want them to think about people in their lives who they can pray for and share faith with. gi: No, that was seven, but I love your enthusiasm! gi: Are there things you hope these future leaders will unlearn by taking your course? PY: That’s easy. All the bad practices that give evangelism a bad name: the manipulative and sometimes violent methods. The risk is not that a lot of people will use these methods, but that the negative stereotypes will keep them from sharing faith in an authentic and healthy way. Bad practices give people an excuse to do nothing. I also want to address and dispel the idea that being Anglican means witnessing silently. For instance, the quote often attributed to Saint Francis, “Preach the Gospel, use words if necessary.” I want to counter attitudes that pitch words against action and evangelism against social justice. There are at least a couple of decades of bad habits and bad theology to unlearn, and I don’t want these to be passed on to yet another generation. gi: What are the primary risks and rewards of evangelism? PY: There is the risk of social rejection, not only from the world but sometimes from fellow Christians, threatened by the thought of sharing their faith. There is the risk that, by doing it badly we may hurt people and make it that much harder for them to receive the Gospel. But the more we practice, and the more we allow the Spirit, who is THE evangelist, to guide us, we will share our faith more naturally. The reward is that we can be part of God’s great welcoming, lifting up Jesus so that the whole world may be drawn to Him. Some of them will be our friends and family. Do you know that I attended my own brother’s baptism just last year? He was 70 and the experience was incredible! I cannot over emphasize the benefit to ourselves when we share. God has written a book in each of us. Each of us, in a way, is a mini chapter in Acts. But if you are like me, I get busy and forget these things. Telling it to another person recalls these mighty acts of God to both of us, and make them fresh again. One way of telling is to first ask ourselves, “What do I know of God and God’s story which is relevant to my friend right now?” That makes God real, or rather, allows us to acknowledge God’s presence. gi: What are some concrete signs of growth in your students? gi: What is your favorite book on evangelism? PY: Currently it is David Gortner’s book, “Transforming Evangelism” which is the text for my course. How I came to it is interesting. I went to teach an evangelism course in Minghua Seminary in Hong Kong and David was the other “international scholar”, staying in the room next to me. I found out that he was an Episcopal priest and the professor of Evangelism at Virginia Theological Seminary. We discovered much in common in our understanding; especially on the point that authentic evangelism is an outflow of life, not a contrived activity. gi: What is your favorite evangelistic book; a book you’d recommend people share with a non-Christian friend? PY: I actually prefer to talk to people rather than giving them books. But when I do, I am quite eclectic. I like C.S. Lewis, of course. His Mere Christianity is a standby. But I also like his more whimsical books, which simply assume a spiritual world. The Narnia Chronicles and the Screwtape Letters are both excellent resources. gi: Bishop Yu, thank you so much for sharing about this course with us. May it bear much fruit! Patrick Yu serves as Bishop for the York-Scarborough region of the Anglican Diocese of Toronto, and teaches the evangelism course that is now a requirement for those preparing for leadership in this diocese. In addition to these diocesan responsibilities, he also has served as the chair of “Anglican Witness”, the Evangelism and Church Growth Initiative (ECGI) of the worldwide Anglican Communion.